As part of the Chicago International Coin Fair held last week at the Crowne Plaza in Rosemont, Illinois, Heritage Auctions held a signature auction of ancient and world coins. In this recap we will take a look at some of the highest prices realized at the main auction, which was held over several sessions. Some of the lots were discussed in our preview article, while others saw surprising results worth mentioning in this recap. Please note that all prices realized include a 17.5% buyers premium. The first lot we will discuss is not a coin, but rather a different numismatic item of major importance, a very rare Brazilian gold ingot dated 1814 and produced in Sabara that was offered as lot 29419. Produced during one of the earlier gold rushes in South-America, these ingots had no denominations and never circulated as money. They are, however, very rare, as many were melted in later years, and only a few hundred different ingots of various producers and sizes are known to exist. The piece, graded “Essentially Mint State”, realized $82,500. Selling for the same price was lot 29751, a very rare PCGS MS64 graded example of the 1894-A 100 Francs, which had an original mintage of just 143 coins. Part of a complete set of this iconic series that was offered in the auction, the date is obviously the key-date of the series, large gold coins struck at the Paris Mint around the turn of the century. It is also considered to be the finest known survivor of this date. With very few coins of this date coming to the market in recent years, the offering was a prime example of a rare coin that can bring out spirited bidding, with the coin realizing $82,250, about double the presale estimate of $35,000-$45,000. Another coin that performed much better than its presale estimate in the catalog was lot 29983, an 1826 PR62 Cameo 5 Pound Gold coin from Great-Britain, which realized $76,375. 5 Pound Gold coins are large heavy gold coins that were struck intermittently throughout the 19th century, but are generally rare, thanks to their large size and limited circulation. 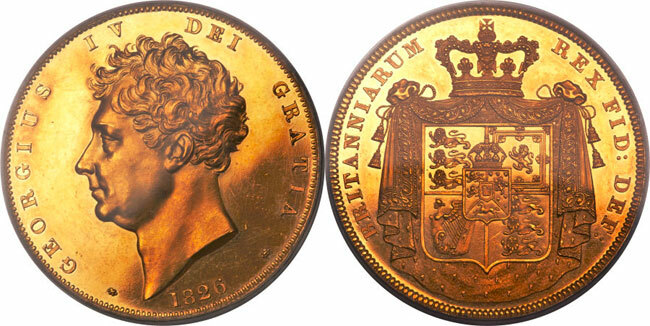 Proofs of many dates are of the utmost rarity, and this 1826 issue, featuring the bust of George IV on the obverse and the arms of Hanover on the reverse is no exception, as the price realized attests. Many ancient coins performed very well, including the two lots that we discussed in our preview, a pair of silver decadrachm’s struck in Syracuse in Sicily during the time of Dionysius, which translates to approximately 406-367 BC. Offered as lots 29016 and 29017, the first brought $70,500 while the second one sold for $58,750. While the coins feature virtually identical designs, they were engraved by two different artists, as shown by their names that appear on the coins. These two coins are rare examples of ancient coins from which we know the name of the artist that created them, although nothing else is known about the two artists. One more noteworthy result from the auction that we like to mention is lot 30063, which sold for $28,200 after the catalog placed an estimate of $8,000-$12,000 on the coin. The item in question is a very rare, possibly unique pattern for the Great-Britain 1953 Coronation Crown, a common issue struck in copper-nickel, which is easily found in uncirculated grades. The pattern issue, graded UNC Details (Inscription Removed) by NGC has the common obverse seen on the issued coin, but a different reverse. Queen Elizabeth II herself is said to have disapproved of the original design seen on this pattern, which shows certain emblems in a very large scale. The issued coin has these emblems placed on the reverse in much smaller format. This coin shows that the market for rare items from Queen Elizabeth’s lifetime are starting to attract more and more attention as she is said to overtake Queen Victoria as longest-reigning British Monarch later this year. Many other items performed very well, showing that the market for rare and quality world coins remains very strong, especially for items that are very seldom encountered. With several coins breaking records for their respective issues the auction was a success for many buyers and sellers, many of whom must look back at the auction with great satisfaction.